The word “drip” has a negative connotation. 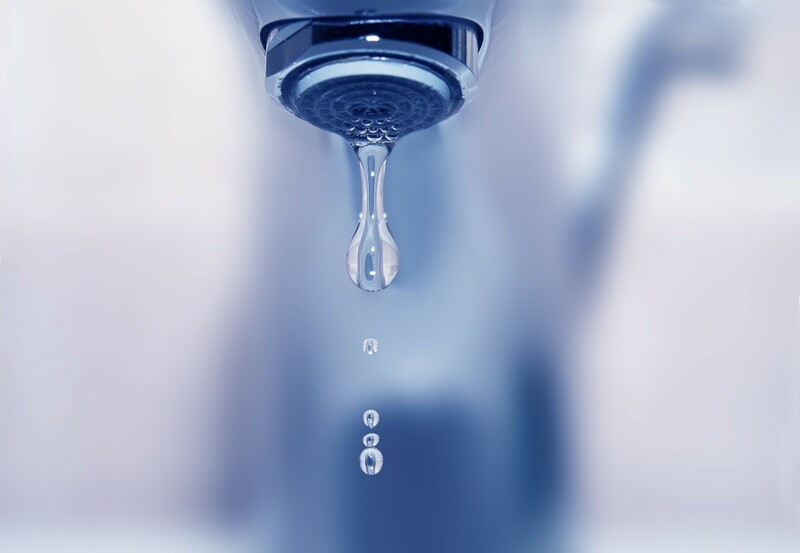 It can be an insult – “That guy is a real drip.” It can also mean a leak or not enough water. But when it comes to creating wealth, a DRIP (dividend reinvestment plan) can be the best thing that ever happened to an investor. When an investor enrolls in a DRIP, the dividends are automatically reinvested in the stock at the time they’re paid. So if you own 100 shares of Company X, currently trading at $40 per share, and you receive $100 in dividends ($1 per share), the $100 automatically buys 2.5 shares of stock… increasing your total count to 102.5 shares. 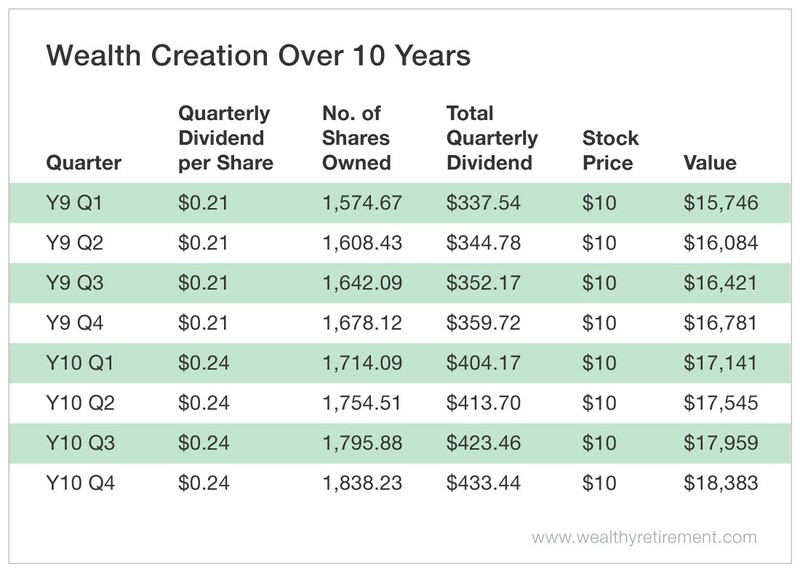 Next quarter, if the dividend stays the same, you’ll receive another $102.50, which will automatically purchase even more shares… and so on… and so on. 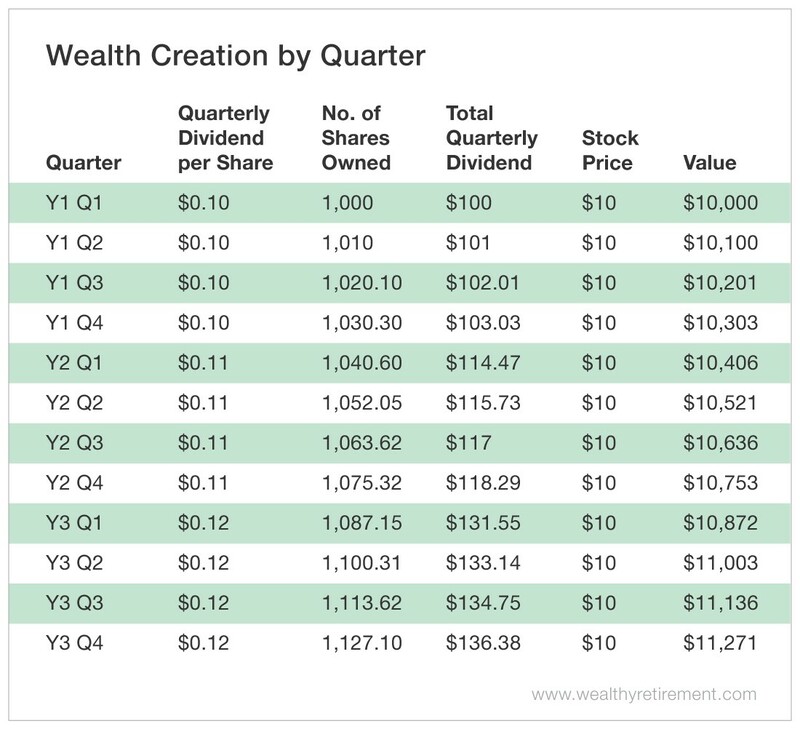 In my book Get Rich with Dividends, I use a table to show, quarter by quarter, exactly how much wealth is created over time. I’ve reproduced a portion of it for you here. We’re assuming the investor bought 1,000 shares of a $10 stock that pays a dividend of $0.10 per share per quarter (which equals a yield of 4%). In this example, the stock price never changes. But look what happens if they stay invested for 10 years. After 10 years, just by buying the stock once and letting the dividends compound, the investor has generated a return of 83.8%. Now let’s say after 10 years, the investor retires and decides to stop reinvesting the dividend. Instead, they take it as a cash payout. What started out as a $100-per-quarter (or $400-per-year) dividend is now $433.44 per quarter, or $1,733.76 per year. In other words, the investor greatly increased their income by reinvesting the dividend for 10 years and then taking the payout. Keep in mind that we have not even talked about selling the stock yet. We simply stopped the DRIP and are taking the dividends as a cash payout. Of course, there are several variables that will change through the years. The stock price will not stay the same, and the investor will reinvest dividends at different prices. It is interesting to note, though, that a bear market is actually a DRIP investor’s best friend. Why? Because we can reinvest the dividends at lower prices. If the stock price is lower and the investor isn’t selling, who cares where it is, right? If we’re reinvesting the dividend, we should pray for a bear market. That way we get more stock at lower prices, which will generate more dividends, which buys more stock, which generates more dividends… You get the idea. The other variable besides stock price is the size of the dividend. If the investor owns a stock that grows its dividend every year – what I call a Perpetual Dividend Raiser – the higher payout buys more stock, which spits out more dividends. The best part about reinvesting dividends is that it’s easy and free (in most cases). The easiest and cheapest way is to enroll your dividend-paying stocks in a DRIP with your broker. Most brokers offer the plans for free. All you do is call them and tell them you want all or specific stocks enrolled in a DRIP. That’s it. Each time you’re paid a dividend, it’ll automatically buy more shares of stock. In almost every situation, I recommend handling your DRIP through your broker. It’s nearly always cheaper and much more convenient to have all of your stocks in one place, rather than having to keep tabs on DRIP accounts for each individual stock. There are a handful of companies that allow shareholders to reinvest their dividends at a discount to the market price. To find out if a company offers a discount or has any associated plan fees, visit its investor relations web page. Best of all, it’s a strategy that has withstood the test of time. It has proven over and over again that the longer you stick with it, the more you make. There are dozens of strategies just like this one that allow you to maximize your returns just by being patient. After a few years, that small drip becomes a cascading waterfall of cash.